I needed behaviour trees because I wanted to manage the complexity of the units AI in Warrior Defense which originally used finite state machines (FSM). FSMs are great because they are so simple and intuitive. When they get big, however, they become so complicated. It got to a point where I’m afraid to change the configuration of the FSM because the working AI easily breaks. In other words, it’s brittle. I don’t like that. I still have lots of features to add later on that deal with unit interactions. Just a part of Defender unit FSM. It looks like spaghetti, yum! 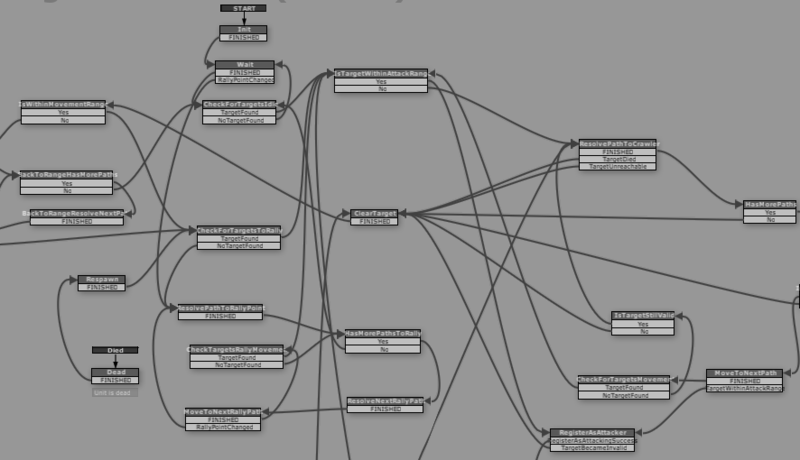 I decided to make my own behaviour tree tool because I can’t find a decent one in the Asset Store. I’m one of those lazy guys that buy a lot of tools. I’ve tried RAIN, which is free. I hated it. The changes to the tree did not reflect in the game right away. It just frustrated me. I’ve bought React while it was on sale but I didn’t like how it worked. Adding actions to it was clunky. It uses functions and runs it in a coroutine. It doesn’t support parameters, as well. Thus, the journey to developing my own behaviour tree tool began. I called it Banana Tree. I completed the core behaviour tree framework (nodes, sequence, decorators) some months ago. But this is pure code. There’s no visual editor. I’ve made AI behaviours that are hardcoded in classes. Production wise, this is not very efficient. AI behaviours changes a lot. Something that changes a lot should not be code, they should be data. I thought that I should probably make a data driven behaviour tree tool. Looking at the FSM above, I think I’ll be making a lot of code anyway using the current framework. High level behaviour nodes. It looks very neat. What I’d like to point out is that it’s still complicated, but it’s now more manageable. I can complete one branch of the behaviour and forget about it once it works and begin working on another one. My brain is not strained so much to the amount of visual objects because I can just fold the node and stop thinking about the things beneath it. It’s so unlike FSMs where you can’t help but see the states and their wiring. Using behaviour trees feels more like programming. Each node feels like a function. Working with an FSM feels like wiring. It is static as “wire one event to one transition state”. I now understand what articles about behaviour trees mean when they say FSMs are constricting (I didn’t get it before). Behaviour trees don’t have wires. They execute on how the tree is structured. What to do next is not explicitly stated in the behaviour tree. It can select a lot of possible action branches to execute. In FSMs, you have to explicitly specify what state it should go next. This could be limiting because there may be a lot of possible states to go to. It’s possible to make it work like a behaviour tree but you’ll need more work and maintenance to the FSM. You’ll most probably end up with an FSM like the one I showed. I can’t say that behaviour trees are better, either. They also have a major disadvantage: steep learning curve. You have to think like a compiler when working with BTs. You have to know what its elements mean like Sequence, Selector, Parallel, Decorator, etc. Like every skilled programmers say, “Know your tools. Know where it’s best used.” Behaviour trees has been proven to work on complex behaviours, but I probably can’t give this to a non programmer and let him/her figure it out on his/her own. FSMs are much more easier to understand. They are far more intuitive, too. FSMs are probably the way to go if you only need to model simple behaviours. 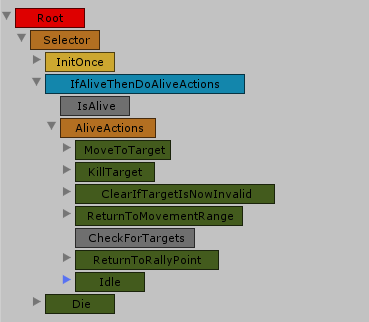 I am just getting started with Unity scripting and was going to start writing a behavior tree editor when I saw this. Are you making banana tree editor available at all? I would love to learn from it. I would love to release Banana Tree as a free product but you’d have to wait for it because the current codebase is still quite coupled with our current game Warrior Defense. There’s some effort required to fully extract it as a separate project. I actually wanted to release this as an Asset Store product later, but then I found out about Behaviour Designer. It works exactly like Banana Tree but with more features and a freakingly sleek UI. You should probably check that out as well. How do you use coroutine in your banana tree? Does every node has one? What do you use the coroutine for? Each action in Banana Tree has an Update() method. I use that for actions that need multiple frames like movement. I didn’t really need coroutines for those. We used reflection. We serialize the nodes as string then at runtime, we load the class that string represents.